Devils Tower is a monolithic igneous intrusion or volcanic neck located in the Black Hills in northeastern Wyoming (U.S.), above the Belle Fourche River. Devils Tower National Monument is a popular tourist attraction, made especially famous after being used as a central plot element in the popular 1977 motion picture, Close Encounters of the Third Kind. The Antiquities Act, granting the President authority to restrict use of particular public land owned by the federal government by executive order, bypassing Congressional oversight, was signed into law by President Theodore Roosevelt in June 1906. 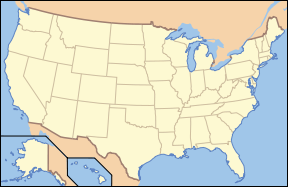 It grew out of the result of concerns for protecting mostly prehistoric Native Americans ruins and artifacts. 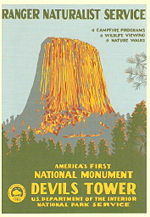 Three months after signing the bill, Roosevelt declared Devils Tower the first U.S. National Monument on September 24, 1906. The Monument's boundary encloses an area of 2.1 square miles (5.4 sq km or 1,347 acres). The Monument is a popular destination for rock-climbers. Like the surrounding Black Hills, Native Americans consider the area sacred, a place for prayer and renewal. When tribes lobbied to have the climbing activity banned, a compromise was proposed by officials—a voluntary climbing ban for the month of June, when the tribes are conducting religious ceremonies around the Monument. Some climbers have brought law suits to challenge the determination. However, the majority of climbers have chosen to avoid climbing in June out of respect for Native religious traditions, though they themselves may not adhere to the same philosophies. Devils Tower is a nearly vertical monolith in northeast Wyoming near the Belle Fourche River, surrounded by Ponderosa pine. It is 867 feet (264 meters) high as measured from its base and 1,267 feet (386 meters) as measured from the river valley; its top has an elevation of 5,112 feet (1,558 meters) above sea level. The summit appears flat from the ground below, though it has a slight dome-shape. Chipmunks, birds, mice, rats and sometimes snakes can be found at the top, which covers approximately 1.5 acres, approximately 200 feet by 400 feet, roughly the size of a football field. Somewhat rocky, native grasses, cactus, moss, and sagebrush grow there. The fluted sides are covered in lichens in some places. There is also a sizable prairie dog town near the base, the circumference of which is one mile. There is a walking trail around it, covering 1.3 miles. Devils Tower was the United States' first designated national monument, established on September 24, 1906, by President Theodore Roosevelt. The Monument's area covers 2.1 square miles (5.4 sq km). There is a myriad of plant and animal life surrounding the monolith. American Native Americans consider the area sacred, a place for prayer and renewal. Tribes including the Arapaho, Crow, Cheyenne, Kiowa, Lakota, and Shoshone had cultural and geographical ties to the monolith known as Devils Tower before European and early American immigrants reached Wyoming. Their names for the monolith include: Aloft on a Rock (Kiowa), Bear's House (Cheyenne, Crow), Bear's Lair (Cheyenne, Crow), Bear's Lodge (Cheyenne, Lakota), Bear's Lodge Butte (Lakota), Bear's Tipi (Arapaho, Cheyenne), Tree Rock (Kiowa), and Grizzly Bear Lodge (Lakota). The name Devils Tower probably originated in 1875, during an expedition led by Col. Richard Irving Dodge when his interpreter misinterpreted the name to mean Bad God's Tower. This was later shortened to Devils Tower. All information signs and references use the name "Devils Tower," following geographic naming standards wherein the apostrophe is eliminated. In 2005, a proposal to recognize these ties through the additional designation of the monolith as Bear Lodge National Historic Landmark met with opposition from Rep. Barbara Cubin, arguing that a "name change will harm the tourist trade and bring economic hardship to area communities." Legends tell of six Sioux girls who were picking flowers when they were chased by bears. Feeling sorry for them, the Great Spirit raised the ground beneath the girls. The bears tried to climb the rock, but fell off, leaving their scratch marks on the sides. Another version tells of how two Sioux boys wandered far from their village when Mato the Bear, a huge creature that had claws the size of teepee poles, spotted them and wanted to eat them for breakfast. He was almost upon them when the boys prayed to Wakan Tanka the Creator to help them. They rose up on a huge rock, while Mato tried to get up from every side, leaving huge scratch marks as he did. Finally, he sauntered off, disappointed and discouraged. 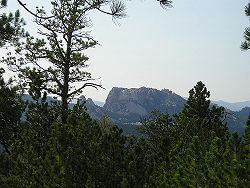 The bear came to rest east of the Black Hills at what is now Bear Butte. Wanblee, the eagle, helped the boys off the rock and back to their village. A painting depicting this legend by artist Herbert A. Collins hangs over the fireplace in the visitors' center at Devils Tower. Devils Tower is a sacred site in the eyes of several Native American Plains tribes, including the Lakota Sioux, Cheyenne and Kiowa. If a man was starving, he was poor in spirit and in body, and he went into the Black Hills, the next spring he would come out, his life and body would be renewed. So, to our grandfathers, the Black Hills was the center of life, and those areas all around it were considered sacred, and were kept in the light of reverence. Because of this sacred belief, many Indian leaders objected to the growing practice of rock climbers ascending the Monument, in effect desecrating a holy site. Climbers, on the other hand, believed climbing the Tower was their right, as it is on federal land. A compromise was reached in 1995, with a voluntary climbing ban during the month of June when the tribes are conducting ceremonies around the monument. Climbers are asked, but not required, to stay off the Tower during that month. According to the PBS documentary In Light of Reverence, in the first year of the ban, approximately 85 percent of climbers honor the ban and voluntarily choose to refrain from June climbs. However, several climbers along with the Mountain States Legal Foundation sued the Park Service, claiming an inappropriate government entanglement with religion. Ponderosa Pine on dark red sandstone and maroon siltstone, interbedded with shale (not visible), along the Belle Fourche River. Ponderosa Pine forest east of Devils Tower. 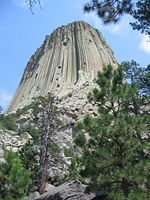 Mato Tipila (Devils Tower) at Devils Tower National Monument. 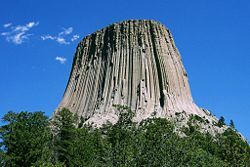 In 1907, scientists Darton and O'Hara decided that Devils Tower must be an eroded remnant of a laccolith. A laccolith is a large mass of igneous rock which is intruded through sedimentary rock beds but does not actually reach the surface, producing a rounded bulge in the sedimentary layers above. This theory was quite popular in the early 1900s, since numerous studies had earlier been done on a number of laccoliths in the American Southwest. Other theories have suggested that Devils Tower is a volcanic plug or that it is the neck of an extinct volcano. Presumably, if Devils Tower was a volcanic plug, any volcanics created by it—volcanic ash, lava flows, volcanic debris—would have eroded away long ago. Some pyroclastic material of the same age as Devils Tower has been identified elsewhere in Wyoming. Geologists agree that the igneous material intruded and then cooled as phonolite porphyry, a light to dark-gray or greenish-gray igneous trachyte rock with conspicuous crystals of white feldspar. As the lava cooled, hexagonal (and sometimes 4-, 5-, and 7-sided) columns formed. As the rock continued to cool, the vertical columns shrank horizontally in volume and cracks began to occur at 120 degree angles, generally forming compact 6-sided columns. 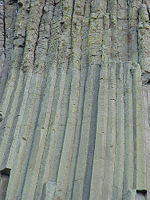 Superficially similar, but with typically 2 feet (0.61 m) diameter columns, Devils Postpile National Monument and Giant's Causeway are columnar basalt. As rain and snow continue to erode the sedimentary rocks surrounding the Tower's base, and the Belle Fourche River carries away the debris, more of Devils Tower will be exposed. But at the same time, the Tower itself is slowly being eroded: Cracks that form the columns are subject to water and ice, becoming larger. Rocks are continually breaking off and falling from the steep walls, and occasionally entire columns fall. Piles of scree—broken columns, boulders, small rocks, and stones—lie at the base of the tower, indicating that it once was larger than it is today. Fur trappers may have visited the Devils Tower area, but they left no written evidence of having done so. The first documented visitors were several members of Captain W.F. Raynold's Yellowstone Expedition, which arrived in 1859. Sixteen years later, Colonel Richard I. 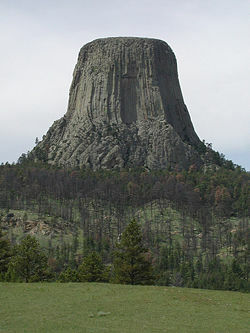 Dodge led a U.S. Geological Survey party to the massive rock formation and coined the name Devils Tower. Recognizing its unique characteristics, Congress designated the area a U.S. forest reserve in 1892 and in 1906, Devils Tower became the nation's first national monument. 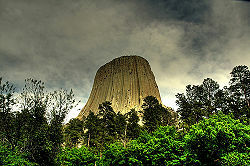 The 1977 movie, Close Encounters of the Third Kind, used Devils Tower as a central plot element and as a location for its climactic scenes. In recent years, climbing Devils Tower National Monument has increased in popularity. Yet men have been climbing the tower for centuries. The first known ascent of Devils Tower by any method occurred on July 4, 1893, and is accredited to William Rogers, a local rancher in the area. Rogers completed this first ascent after constructing a ladder of wooden pegs driven into cracks in the rock face. A few of these wooden pegs are still intact and are visible on the tower when hiking along the 1.3 mile Tower Trail at the Monument. While Rogers may technically have been the first man to reach the summit, the man most famous for first climbing the tower using technical rock climbing techniques is Fritz Wiessner, who first reached the summit in 1937, with a small party from the American Alpine Club. Today, hundreds of climbers scale the sheer rock walls of Devils Tower each summer. These climbers ascend the tower on every side, climbing up the various vertical cracks and columns of the rock face. These paths, called climbing routes, are defined by the old lava flow. Moreover, the difficulty of these routes vary greatly, ranging from relatively easy to some of the hardest in the world. On some routes the gap between columns is just narrow enough to bridge with stretched-out legs, so the climber ascends doing "the splits" all the way. All climbers must register with a park ranger before and after attempting a climb. In 1995, a voluntary climbing ban was instituted by Park officials in order to respect the sacred belief of local Native American tribes. While the tribes had requested a permanent ban, the month of June was selected as a compromise. The largest percentage of climbers respect this ban, but since it is voluntary, there are those who select to climb anyway. Several climbers, along with the Mountain States Legal Foundation, sued the Park Service, claiming an inappropriate government entanglement with religion. A second lawsuit was brought against both the Federal Government and the National Park Service. The complaint was never reviewed by the courts based on standing. Since the plaintiffs were all climbing in June, the Courts refused to review the climbers complaint because they were not being stopped from climbing. ↑ National Park Service, Devils Tower. Retrieved July 17, 2008. ↑ U.S. Geological Survey, Frequently Asked Questions. Retrieved July 17, 2008. ↑ U.S. Congresswoman Barbara Cubin Official Page, Cubin Fights Devils Tower Name Change. Retrieved July 17, 2008. ↑ 4.0 4.1 Amy Corbin, The Three Stories, Earth Island Institute. Retrieved July 17, 2008. ↑ Friends of Devils Tower, Friends of Devils Tower. Retrieved July 18, 2008. Norton, Stephen L. 1991. Devils Tower: The Story Behind the Scenery. Las Vegas: KC Publications. ISBN 9780887140518. Rogers, Jeanne. 2007. Standing Witness: Devils Tower National Monument: A History. Devils Tower, Wyo. : Devils Tower National Monument, National Park Service, U.S. Dept. of the Interior. ISBN 9780615179551. Encyclopædia Britannica Online. Devils Tower National Monument. National Park Service. Devils Tower. History of "Devils Tower National Monument"
This page was last modified on 25 October 2017, at 14:42.